Centre For Development Of Advanced Computing, Is Appointing Eligible Candidates To The Various Engineers And Projects Officer's Posts, So Interested People Can Apply For This Job Of CDAC Before The Last Date, Which Is Mention Below. A. Number Of Vacancies And Name Of The Posts (Advertisement No:C-DAC/Noida/01/February/2019). 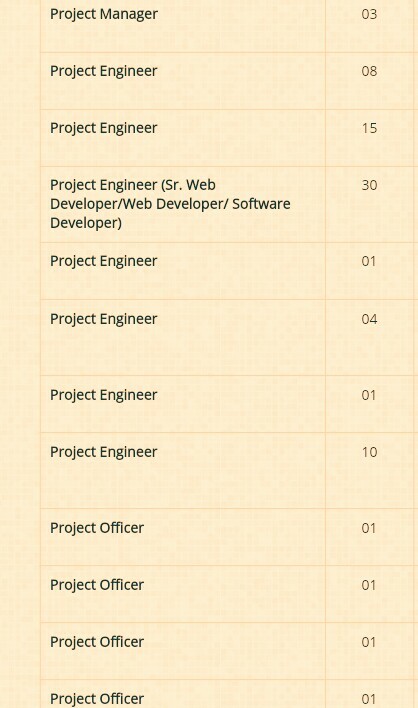 Various Project Engineers/Projects Manager/Project Officer's Vacancies → 76 Vacancies. Total Number Of vacancies →76 CDAC Noida Recruitment 2019, Check The Image Below For Vacancies Distribution. A. Eligible Criteria FoCentre For Development Of Advanced Computing, Noida, Recruitment 2019. Age Limit →Applicants belonging to the reserved category (SC/ST/OBC) / physically challenged/Ex-servicemen would be eligible for relaxations according to the Government of India norms. Government employees will be eligible for relaxation in age by 5 years including other age relaxations. C-DAC internal candidates also will be eligible for an age relaxation of 5 years including other age relaxations. Educational Qualifications →All the qualifying qualifications should be Full time course(s) from AICTE/UGC approved/recognized University/Deemed University/Institutes. The courses offered by autonomous institutions should be recognized as equivalent to the relevant courses approved/recognized by Association of Indian Universities (AIU)/UGC/AICTE. Wherever CGPA/OGPA or letter (A, A+) grade in a qualifying degree is awarded, equivalent percentage of marks should be indicated in the application form as per norms adopted by the respective University/Institute. Please also obtain a certificate to this effect from University / Institute, which shall be required at the time of interview. Candidates awaiting final year examination results are not eligible to apply. Only passed-out candidates can apply. Mode Of Examination/Selection Process →Interview/Online Examination. Online Application/Examination Fee →₹500 For All Unreserved Candidates And No Fee For Other Reserved Candidates Which Includes Female Candidate, Mode Of Payment is Online. Interview For The Post Project Manager/Project Officer→09th Of March, 2019. Online Examination For Project Engineer →09th Of March, 2019. Interview For Project Engineer →10th Of March, 2019. For More Info →Visit The Official Website Here>The Official Website Of CDAC . Now Apply For This Job Of CDAC Noida Recruitment Notification 2019. Click Here For Apply Online And Official Notification.